The Edge burst onto the RV scene in around 2010. 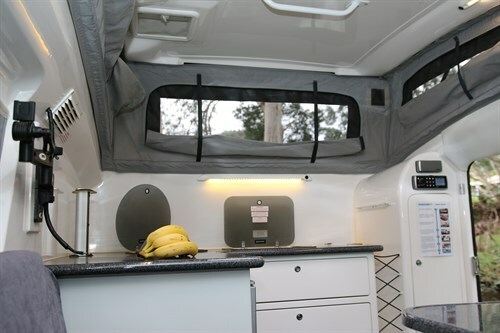 With its inner and outer fibreglass shells and fully moulded fibreglass internal cabinetry, the Edge was cutting edge back then, as there weren’t too many companies making them like that. But after a lengthy absence from the market, the Edge is back. CTA editor at large Max Taylor took the Edge for a spin behind his 80 Series LandCruiser to check it out. "While the Edge hasn’t changed drastically since those early days, it remains a modern tourer for two," Taylor said. "It tows as well as any similarly sized and weighted rigs on the market – if not better – and it has a reasonable amount of equipment on board. Not every latest gizmo and gadget is fitted, mind you, but enough to ensure comfortable travels around Australia." 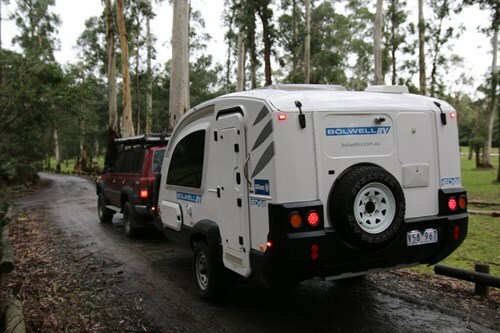 The Edge and its stablemate, the Bolwell Air, are now being fitted out by Track Trailer, the company behind the popular Tvan and Topaz. Basically, the chassis, the SureFoot independent coil suspension, and the body, are still being built by Bolwell. But after these arrive into Track Trailer’s Outback HQ factory in Bayswater North, Vic, Track does the rest. Check out the full review in an upcoming issue of CTA. Subscribe now so you don't miss out!